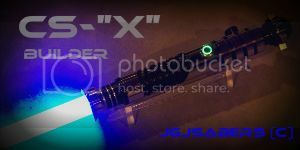 To my custom lightsaber building friends, hopefully you guys can help me with an issue I'm having. I purchased a batch of lightsaber parts from a member on here and was provided with this which I was told was a lighted unit for a custom saber. The wiring is torn from the soldered point at the end of the main body, but when I plug in the 9v battery and connect the soldered point, then power it on, it emits a loud squealing sound. I can solder and fix wiring but not even sure what this is to work with. Any help identifying it would be great. The wiring goes to this black block, looks to be encased in resin. Someone told me this was an EL setup though I wanted to make sure. While its outdated, I would love to still build this up (was basically given free to me). I had it temporarily wired up with a 9v and could hear it buzz when plugged in (read this was normal) but could not find photos of the setup. Last edited by shenphong; 09-23-2016 at 10:32 PM. I came to this hobby after the EL tech was replaced by high powered LEDs, but I'm inclined to agree. That definitely looks like an EL setup. 9v battery, the blade socket, your inverter (your mysterious black box). I don't know that you'd be able to get the electronics working again. It would be easier (and much brighter) to scrap the internals and use LEDs instead. I'm coming to realize that. Heck for the price of the blade setup, I could start looking at "grab bag" sabers from others. Just wanted to play with things, it buzzes when I have the battery wired up and I was told that means its working, but of course can't test it without the blade. I would do some research before buying a "grab bag" saber. Several of the manufacturers that offer grab bag sabers are less than reputable. Most times you're better off building your own with parts from TCSS. That's the blade in the dark. No one uses EL anymore for a reason. Pretty massive difference Jay-Gon. Thanks for the tip as well guys.